Brand: Wilton 2104-0244 Units: 1 set/ 19 pcs. Easily imprint interchangeable heart designs on buttercream or fondant cakes. 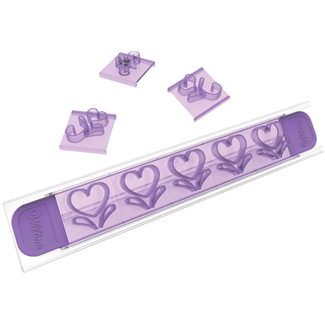 Slide tiles onto the holder and imprint the design into buttercream or fondant icing to create an easy-to-folow tracing line. With a decorating tip and bag, trace over the imprint for perfect lettering. Also works great with cookie dough. Set includes 16 tiles of 4 different heart designs, 1 holder, and 2 locks. Designs measure 3/4" to 1" tall. Easily imprint interchangeable heart designs on buttercream or fondant cakes. Slide tiles onto the holder and imprint the design into buttercream or fondant icing to create an easy-to-folow tracing line. With a decorating tip and bag, trace over the imprint for perfect lettering. Also works great with cookie dough. Set includes 16 tiles of 4 different heart designs, 1 holder, and 2 locks. Designs measure 3/4" to 1" tall.